Now that spring is here and nice weather, my son can't wait to get outside, run around and play with his great new CAT trucks that we received from Toy State! Toy State’s Cat® line features iconic machine styles that bring “The Feel of Real” to young construction enthusiasts. The wide range of classic play functions, along with exciting lights & sound features will encourage creative play and lead to hours of playtime fun. 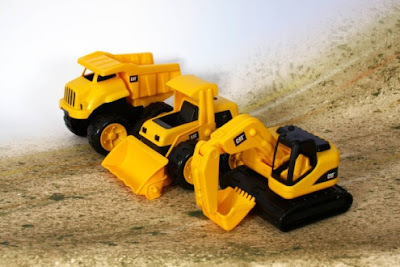 We received two great CAT products: the Tough Tracks and CAT E-Z Machines R/C. Outdoor play just got a lot more fun! Now young machine enthusiasts can experience the “feel of real” with Cat Tough Tracks, the perfect addition to any fun-filled day. 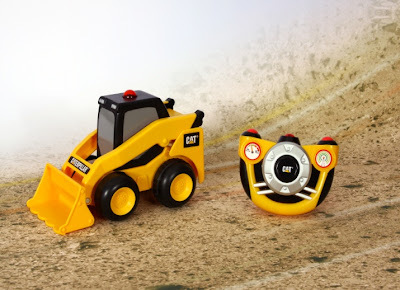 Kids will have a blast as they dig and play with these free-wheeling construction trucks. Assortment includes: Cat Dump Truck, Cat Wheel Loader & Cat Excavator (2pk. $13.99 and 3pk. $21.99). My son loves taking these trucks out to the sandbox, park and even on the grass and driveway! He loves making noises, digging "treasures" up, and pretending with these trucks! They have definitely provided hours and hours of fun outside! My son loves ANYTHING that has a remote control and that he gets to control! This CAT E-Z Mahine is so easy to move around and that makes it the perfect first remote control toy for young children! It is really simple and easy to operate: Just a simple single-button activation allows the child to steer his Cat machine forward when pressing the button, or watch it spin in circles when the button is released or if the toy goes out of range. So if your child is a fan of big trucks and CAT vehicles, get them the great CAT trucks from Toy State's line of CAT and CAT Preschool trucks! They have a great selection and you are sure to see your child's eyes widen with excitement when they get to operate and "drive around" their own CAT truck! Buy It: You can purchase available CAT and CAT Preschool trucks now at Toys R Us, Wal-Mart, Kmart, Target and Amazon.com.